What is the difference between outpatient surgery and inpatient surgery? What will health care professionals be involved in my surgery? What can I do to help ensure my surgery will go smoothly? What is involved in a presurgery checkup? What may preparation be necessary before surgery? What may preoperative preparation occur? What will happen once I am in the operating room? What should I expect when the operation is over? What things do I need to know before I go home? Outpatient surgery also called ambulatory or same-day surgery does not require an overnight stay in the hospital, meaning that you can go home the same day if your condition is stable. You will need someone to drive you home. Outpatient surgery may be done in a hospital, health care provider’s office, surgical center, or clinic. 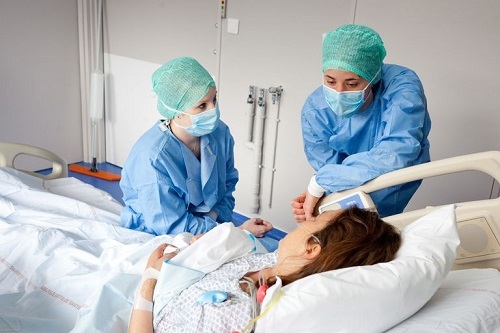 Inpatient surgery takes place in a hospital and requires an overnight stay. Your health care provider leads a team of healthcare professionals who will work together to care for you before, during, and after your operation. Nurses will assist your doctor during surgery, perform special tasks, and help make you more comfortable. A resident or fellow may help during your surgery. The anesthesiologist is the person who is in charge of giving anesthesia and checking its effects. If you smoke, try to stop smoking before your operation. General anesthesia affects the normal function of your lungs. If you are taking medication, ask if you should keep taking it before or after the operation. Make sure your health care provider knows all of the medications you are taking, including those that have been prescribed for you and those that are bought over-the-counter, such as vitamins, herbs, or other supplements. Follow a special diet before surgery if your health care provider suggests it. If you have diabetes, controlling your glucose levels before surgery may improve healing. A week or two before your surgery, you may need to have a physical exam and tests, which may include lab tests of your blood and urine, a chest X-ray, and an electrocardiogram. An electrocardiogram is a test of heart function with an instrument that prints out the results as a graph. Depending on the type of surgery, your health care provider may want you to use a laxative and eat lightly. Do not drink alcohol 24 hours before surgery. You also may be asked to use an enema at home a day or two before some types of surgery. Remove any nail polish or acrylic nails. Do not wear makeup. All jewelry usually needs to be removed from your body before the operation. If you will be staying overnight, bring only those items you will need, including a case for glasses, contact lenses, or dentures. You will be given an ID bracelet. It will include your name, birth date, and health care provider’s name. Be prepared to go over your health history, as well as any drug allergies, or allergies to food or latex (some surgical gloves are made of latex). You will be asked what medications you are taking. You will change your clothes into a hospital gown and maybe a cap. Steps may be taken to help prevent deep vein thrombosis. You may be given special stockings to wear, or inflatable devices may be put on your legs. You may be given drugs to reduce the risk of deep vein thrombosis. You will be taken to an area to wait until the surgical team is ready for you. Your health care provider or team will confirm your name, birth date, and type of surgery before you go to the operating room. If the operation is to be done on one side of your body, the site may be marked with a special pen. An anesthesiologist will discuss which type of anesthesia you will receive during the operation. A tube called an intravenous (IV) line may be placed into a vein in your arm or wrist. It is used for supplying your body with fluids, medication, or blood during and after the surgery. You may be given medication to help you relax. You also may be given other medications that your doctor has ordered, such as antibiotics to reduce the risk of infection. After you have been taken into the operating room, you will be moved to the operating table. Monitors will be attached to various parts of your body to measure your pulse, oxygen level, and blood pressure. The surgical team may again ask you your name, date of birth, and what operation you are having. A final review of medical records and tests may be done. If you are having general anesthesia, it will be given through your IV line. After you are asleep, a tube called a catheter may be placed in your bladder to drain urine. Once the operation is over, you will be moved into the recovery area. This area is equipped to monitor patients after surgery. Many patients feel groggy, confused, and chilly when they wake up after an operation. You may have muscle aches or a sore throat shortly after surgery. These problems should not last long. You can ask for medicine to relieve them. You will remain in the recovery room until you are stable. As soon as possible, your nurses will have you move around as much as you can. You may be encouraged to get out of bed and walk around soon after your operation. You may feel tired and weak at first. The sooner you resume activity, the sooner your body’s functions can get back to normal. Before you leave, a nurse or other health care provider will go over any instructions on diet, medicine, and care of your incision. You will be told what things or activities you should avoid and for how long. You should know who to call if you have a problem and what things you should call your healthcare providers about, such as a fever or increased vaginal bleeding. If you have had major inpatient surgery, it will most likely take a month or more before you are ready to resume your normal schedule. Minor operations require less recovery time, but you may need to cut back on certain activities for a while.